The Kodiak Canvas 9 x 8 Tent is great whether you are headed to the campground with your family in the mountains or by a beach, or elk camp with your hunting buddies. This rugged, all-season tent is great for the occasion. Made with premium grade, Hydra-Shield, 100% cotton duck canvas (walls: 8.5 oz , roof: 10 oz). The tight weave and silicone finish make the canvas tent watertight yet breathable, minimizing condensation, and mugginess. Go ahead and touch the inside walls during a downpour this canvas will not wick water keeping you and your possessions dry. 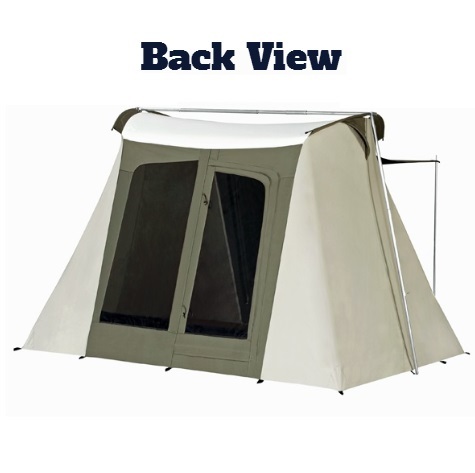 The Flex-Bow frame has tempered, spring steel rods that keep the tent taut, and robust 1 inch steel tube poles that will hold up to fierce winds. The floor material is a super-duty, puncture resistant, 13 oz vinyl with welded seams that keeps water out. Easy, one-person setup takes only a few minutes after you have it staked out. The steep walls and 6 foot high ceiling provide a roomy interior with stand-up, walk-around comfort. Two large doors with top rated #10 YKK zippers give convenient access to front and back. Four windows, and two vents allow ample air flow. Windows and vents have no-see-um screen mesh, keeping out the smallest pests. A large awning provides shade and a covered entry. The handy large storage bag means no cramming into an undersized bag. Hefty 12 inch steel stakes included. 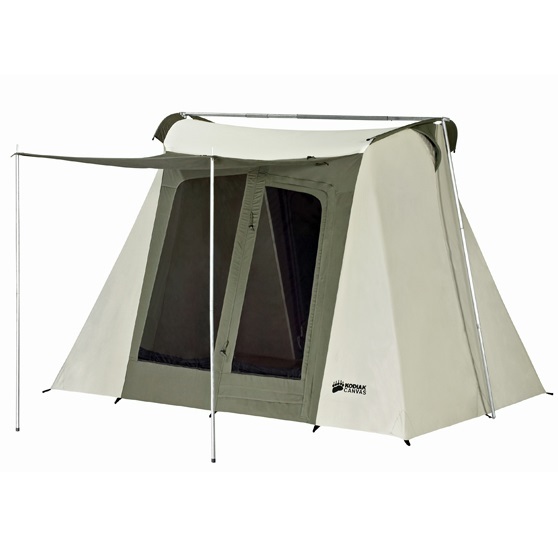 Warranty This tent includes a limited lifetime warranty from the manufacturer, Kodiak. *Low price guarantee offer subject to product availability and manual review of the competitor offering. Call for details. Hydra-Shield, 100% Cotton, Duck Canvas. Durable, watertight and breathable. Flex-Bow Frame: Exceptionally sturdy. Keeps tent taut. Quick and easy, one-person, setup. Spacious 6 Foot ceiling height provides walk-around comfort. Two large D-shaped doors (front and back) with #10 YKK zippers. Four large windows with no-see-um mesh. Front Awning (70x57 inches) provides covered entry and shade. Customizable organizer pockets (1 pocket organizer, 1 bag organizer, 2 sewn in pockets). Designed for compact storage. Two funnel-flow vents. 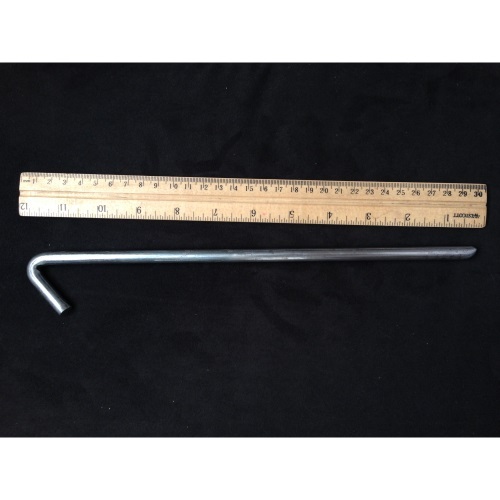 Heavy-Duty 12 inch, steel rod, stakes. Handy large zippered storage bag. 9x8 Canvas Tent Specs: Approximate Weight: 54.5 lbs lbs. (includes 6.5 lbs in stakes). Tent storage bag: 24 inches L x 13 inches Diameter. Pole storage bag: 35 inches L x 5.5 inches Diameter. Capacity: 4-person (9x8 Ft). Ceiling Material: 10 oz Hydra-shield cotton canvas. Wall Material: 8.5 oz Hydra-Shield" cotton canvas. Floor Material: 13 oz vinyl. Polyester reinforced, welded seams. Leading competitor S.Bar uses a 10 oz weight. Frame: 1 inch, galvanized, steel tubing. Flex-Bow Rods: 3/8 inch, solid, spring steel. All-season: Use year-round but not designed for extreme winter mountaineering, or heavy snow accumulations. Warranty: Lifetime limited warranty. Spacious 6 Foot ceiling height provides walk-around comfort. Four large windows with no-see-um mesh. Front Awning (70x57 inches) provides covered entry and shade. Customizable organizer pockets (1 pocket organizer, 1 bag organizer, 2 sewn in pockets). Handy large zippered storage bag. Approximate Weight: 54.5 lbs lbs. (includes 6.5 lbs in stakes). 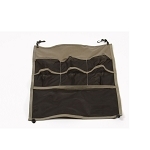 Tent storage bag: 24 inches L x 13 inches Diameter. Pole storage bag: 35 inches L x 5.5 inches Diameter. Wall Material: 8.5 oz Hydra-Shield"! cotton canvas. Floor Material: 13 oz vinyl. Polyester reinforced, welded seams. Leading competitor S.Bar uses a 10 oz weight. All-season: Use year-round but not designed for extreme winter mountaineering, or heavy snow accumulations. If you are looking for a canvas tent this is a good choice. Unique setup but after one time no problem. Straight walls gives plenty of ceiling height. Canvas material heavy, park close to where you are camping, but canvas insulates better than nylon. Service, Quality, Price, Pick any two? In this day it is hard to find quality and service at a competitive price. 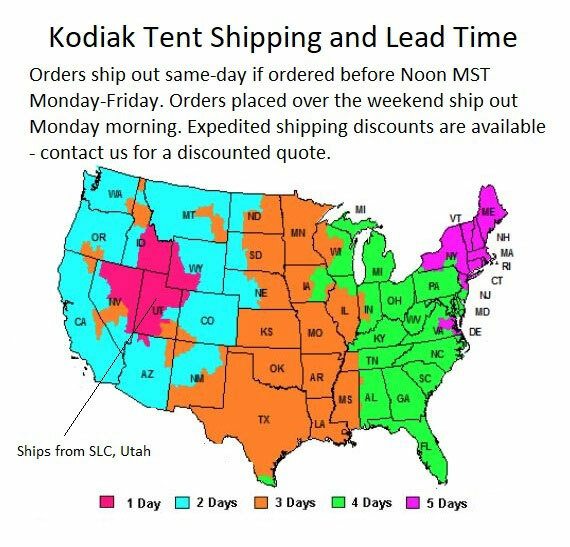 However, I found all three buying my Kodiak #6098 Tent through Competitive Edge products. I ordered via the Internet Sunday and set it up in my back yard today, the following Thursday, two time zones away. Quality materials, construction, and well thought out design. A lot of tent for the money. Easy set up and take down by one person. It takes longer to pound in the tent stakes and pull them out, than it does to set up the tent. I have set it up twice, and have used it once, on a four day weekend, it did rain. No leaks anywhere. Also, the staff at Competitive Edge is very professional and helpful. These days, so many companies seem to be skimping on quality with their products. When I buy a product, I am interested in quality and longevity. This tent is top notch. If I need more camping gear Ill visit your site because I know your products are quality built. We received this about a month or so ago and just set it up. WOW setup took about 15 minutes and tear down about 10. These times include taking out of bags etc. We have not use the tent but plan to this weekend at The Grand Canyon. It was rather windy the day we put the tent up and inside you could hardly tell the wind was blowing! It is a very well built tent. Should do well this fall when we go up to the mountains in Northern Nevada hunting! I love how easy it is to set this tent up and take it down. The only thing I would change is where its made(China). Competitive Edge Products gave me great service. They answered all my questions about delivery times and when they realized I was anxious to get my tent they had an employee who lived in the area drop it off at my house personally. Great tent! I've only used it once and set it up twice. I'm very pleased with how well this tent is made and the attention to detail. I WOULD like a slightly larger carry bag for the tent and I went and bought a bigger one. If you pack your tent, tightly and know how to fold it, it will fit, but just a couple more inches in the bag would be nice. I may have had too much tension on my canopy ropes, but my tent began pulling up on the back side and I'd recommend running a couple of lines up to the top pole junction and stake behind. Great tent!... Very impressed. Q: Please can you supply me with a quote for 6 full sets of equipment to erect the Kodiak 9x8 model 6098 please? We are a safari conservation company based out of Maun in Botswana. We have 6 of them but the poles and adjustable bits and pieces are now worn and screws don't turn and springs are all but gone inside the poles. IE sliding sleeves no longer work and so on. We begin our new trails season on the 28th of May and urgently require these parts to be with us within the next few weeks at least. look forwards to hearing from you via my mailing address. Q: How heavy is this? Is there any easier way to carry it a few miles? Q: Is there a way to hang a lantern from the ceiling? A: Unfortunately, we don't ship these internationally. Sorry for the bad news. Q: For 2017 it looks like Kodiak has started using metal stake loops. 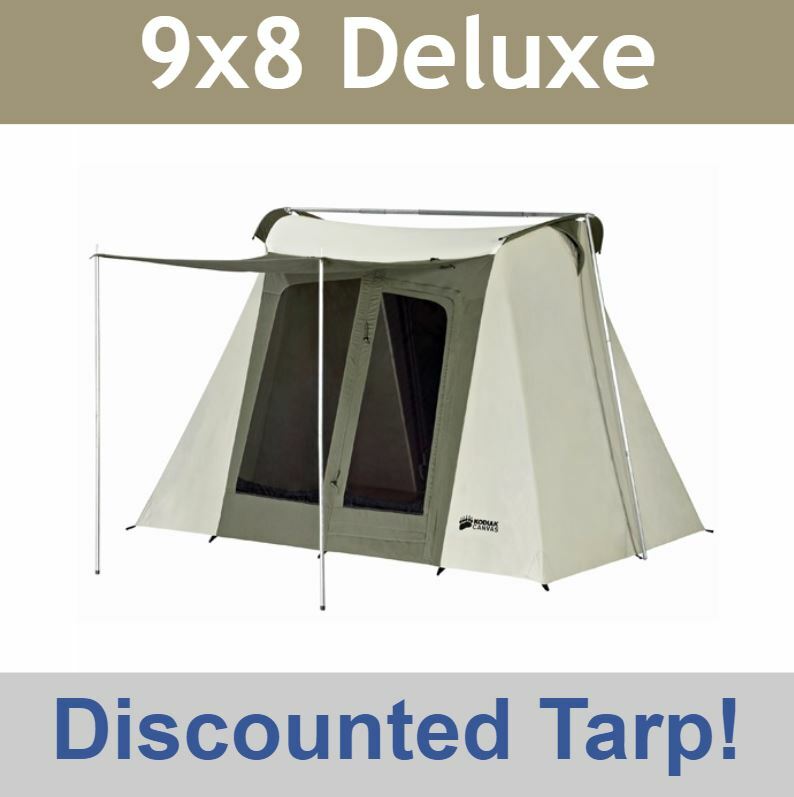 Does this tent, the 6098 (9x8) tent have the new metal stake loops? A: Yes, we only sell the metal stake loops. 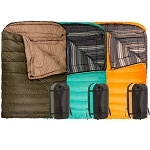 Q: Is the Pocket Organizer & the front awing extra or do they come with the purchase of this tent? A: They are included free. Q: on the 9x8 Deluxe. It says price at 459.99 but if we add the $10.00 tarp, the price changes to $479.99. which is correct? A: Yes, without the tarp the price is 459 99 at the time this answer is posted. With the tarp the price is 479 99. Q: Are there canvas flaps that can cover the doors and windows? A: Yes, there sure are. Is it's up watertight. Q: Where does tarp attach to tent? A: The tarp is specially made to the same size as the tent, so it will line up with the bottom of the tent. The tarp serves to add an extra layer of protection to the bottom of the tent in order to keep it in good condition. A: The answer provided is NOT accurate. The Ground Tarp is SMALLER than the tent. According to KODIAK, it is that way to prevent water from flowing under the tent. From "LOOP" to "LOOP", the TENT is 100"x109". ... The Tarp is 92"x104"
Q: Does this tent come with the wrap around storage bag? A: This tent comes with a Handy Large zippered storage bag. A: As stated the 8x9 Does NOT come with the Wrap around bag. I bought the Wrap Around bag directly from Kodiak for about $25... And yes it is much much easier. Q: I'm interested in buying one of those Kodiak combos but I need 2 more information what's a flex flow ? Q: Regarding the Kodiak Flex bow 4 person tent, most sites list the height at 6'6, and yours is 6 foot. Can you advise why? 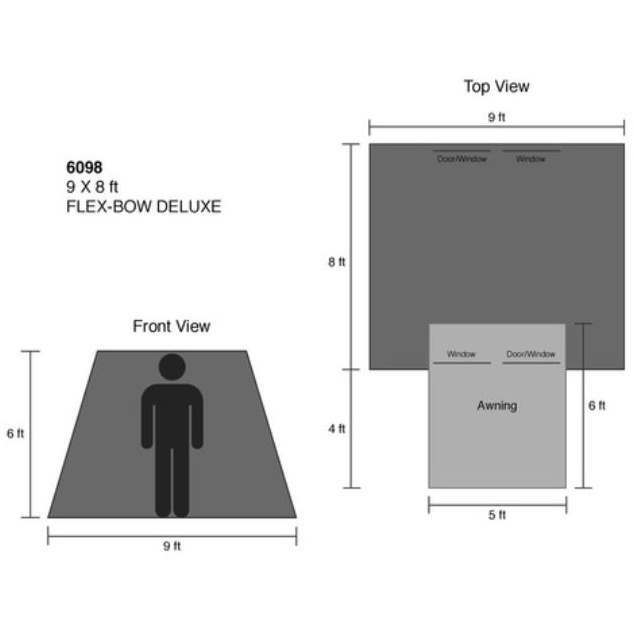 A: They are mistaken, this tent is only 6' but the 10' x 14' tents are 6' 6"
A: AND the 10' by 10' is also 6' 6" Tall. 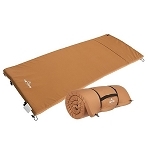 Q: Will my cot size 40 inches wide by 85 inches long fit okay along with a camp chair in the 9 x 8 tent? Also, I am exactly 6 ft. tall. Will I be able to completely stand up in the 9 x 8 model? A: I am 5'10" and the top of my hair brushes against the top so I would say that your head would touch in the low spots. Everything else would fit. Q: is there enough room for me (1) my cot+small kitchen for cooking when its raining? Would you be willing to make a vestibule for this model? A: There is certainly enough room for one person and their gear. We do not recommend cooking in this for safety reasons. We have no plans to make a vestibule for this model at this time. Q: On a scale of 1-10, how well does this tent protect from the elements such as rain, sun, and hot/cold climates? A: After you have seasoned the tent (set up the tent, wet it down with a light water spray, and allow the tent to dry completely) the tent does very well with keeping rain out. Canvas is fairly heavy material compared to nylon tents and it is does very well with keeping the sun out too. Canvas does breathe a bit, but if you do not have windows open in hot temperatures, the tent can get pretty hot inside. The tent is excellent is cold temperatures. Numbers are subjective, but if you twisted my arm, I would say rain - 9, sun 9, heat 7, cold 9. Dimensions: 35" x 11" x 14"